An explosion in a Mexico City nightclub takes the lives of one hundred and fifteen people, eighty-five of which were American citizens. Claiming responsibility for the attack is a small terrorist group angered by the UN sanctions against the African country Kahndaq. They have struck America, but according to reports, they have been struck back; two of the four terrorists are dead... their bodies burned almost beyond recognition. The third member is added to the list of casualties when Major Force catches up to him. Meanwhile, back in America, the fourth and final terrorist has locked himself in a penthouse suite where, it is reported by government sources, he is holding a "dirty" bomb. Captain Atom arrives on the scene per President Luthor's orders and is soon joined by Superman, who is there of his own choosing. While the two heroes reason their situation, Major Atom offers the Man of Steel a position similar to his own: serve the United States by becoming a government agent. Superman refuses, claiming he will not work for President Luthor, and furthermore, that his mission is not to serve only America, but rather the entire world. The Major and Supes engage in an argument until they are interrupted by Major Force, who attacks both heroes before they can react. Claiming the battle for his own, Captain Atom urges Superman to stop the terrorist while he deals with Force. However, before the Man of Steel can even reach the building, Batman has arrived on the scene, knocking an Uzi from the terrorist's hands and demanding to know where he has hidden the "dirty" bomb. Overhearing Major Force's banter with Captain Atom, in which Force reveals an bomb within the building will soon be set off to take out the terrorist, Superman speeds inside, grabbing Batman and the terrorist before the explosion can demolish the top floor of the apartment building. Captain Atom, meanwhile, drains off Major Force's energy, leaving his powerless foe to crash atop the burning building. With the disaster averted, Superman, Batman, and Captain Atom meet atop another building. Batman has reasoned that Major Force was a government sanctioned agent, just like Atom, and that he was sent here to engage Atom in a fight. While the two were fighting, a bomb the US government had planted inside the building would take out the terrorist. Atom loudly rebukes the Dark Knight's conspiracy theory, while Superman cautions Captain Atom to remember that when one is in a position of power, it's easy to forget what that power should be used for. Captain Atom returns to President Luthor in the Oval Office where Luthor sits him down and tells him what he claims is "the Truth." It's another day at Smallville High when Principal Goodwin meets with "Mr. Luthor," an actor that young Lex has paid to serve as his guardian in order to avoid foster parenting. Principal Goodwin informs "Mr. Luthor" that Lex has failed his standardized test and that he will be placed in ninth grade. Meanwhile, Lex sits outside the office, tapping into GPS signals with his GameBoy. About to introduce young Lex to a class where Clark and Lana complain about the busted furnace in mid-winter, Principal Goodwin turns around to see that his newest student has suddenly disappeared. Finally finding him in the furnace room, Goodwin yells at Lex, but not before Clark arrives to point out that the young Luthor has managed to fix the furnace by converting the coal burner to an electric heat pump in four minutes. As Goodwin's mouth gapes open, Luthor smugly hands over the correct standardized test answers. It's a sunny day in Smallville, and Clark Kent and Pete Ross are playing baseball in a field. Clark nails Pete's pitch, sending it off into the distance. When the two recover the baseball, they notice a boy sitting in an expensive automobile underneath a tree. The boy's driver, Alfred Pennyworth, is fixing the tire as young Bruce sits and stares out of the window. Clark and Pete consider briefly whether to ask the young boy to join them in a game until they decide that he probably wouldn't want to play anyway. They run off into the sun while young Bruce sits alone in the car, covered in shadows. Profile Pages with text by Mike McAvennie and Scott Beaty; art by Ed McGuinness, Scott McDaniel, and Norm Rapmund. 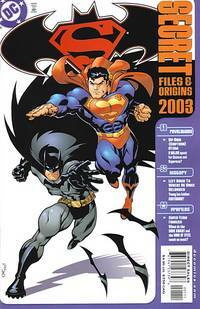 Story - 3: A decent collection of stories that serve as some adequate background for the Superman/Batman ongoing series. While I find most of these Secret File one-shots to be a waste of time and money, this one at least offers some engaging stories. None of them are essential for readers following the Superman/Batman ongoing, but there are some nice accentuations here. "Young Luthor" is probably the one exception; it's a fun little story, but it seems out of place and more suited for Waid's Birthright series. The major story, however, "Recruits," is well-written and timely. It shows how heroes like Superman and Batman fit into a post-9/11 America. The argument between Captain Atom and Superman, for instance, is especially revealing, and Superman's assertion at the end of the story about the misuse of power is another highlight. The final story, while brief, is really quite nice. I think it would have benefited from less captions and dialogue... in fact, maybe none at all. The art really tells the tale and drives home a basic, intrinsic difference between Bruce Wayne and Clark Kent. Art - 4: Nice effort all around by the artists on this book. "Recruits" has its ups and downs artistically, but its ups consist of a two-page stunner with Superman saving Batman and the terrorist from and explosion and a nice sequence that runs between Supes, Bats, and Capt. Atom atop a building. "Young Luthor", meanwhile, is capably handled and though nothing stands out particularly, I do find it interesting the extent to which the Smallville television series has had its effect stylistically. Finally, Tim Sale does a beautiful job contrasting Bruce and Clark in the final story. I love how as bright and beautiful his Smallville is, in the car, Bruce is concealed in grays, blacks, and whites. A really superb effort on Sale's part. Cover Art - 4: Here they come! Supes and Bats right at ya! I would have preferred that that bar on the side were removed, but regardless, it's a nice image by McGuinness.